PowerBar is for performance athletes. Picture Lance Armstrong eating one on his bicycle. Amateur athletes that ride miles on their bicycles every day will bring a Power Bar to consume. The reason they don't bring something like a Banana is that it gets squished. Power Bar's are very portable and easy to throw in your fanny pack. For the regular person who does 30 minutes of walking per day, PowerBar isn't for you. PowerBar should be commended for trying to help athletes, but it is a highly technological food for situations where you are a very serious athlete. The first ingredient in a PowerBar is sugar (to give you energy) and then the second is oat bran (a slow burning carbohydrate to keep you going). For those of us just trying to be fit, a Banana is an excellent choice. Bananas contain potassium and other nutrients your body will use to help keep you going. Also, it has less than half the calories of a PowerBar. 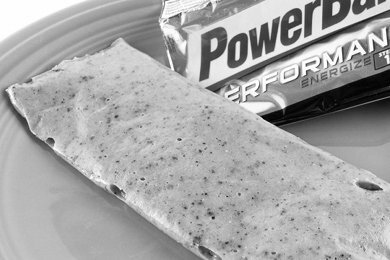 If you are in training for a marathon or the Tour de France, eat PowerBars while you train. Also, you could eat an Apples for a quick energy fix, and then some whole wheat crackers like Triscuit for the complex carbohydrate to keep you going. If you then took a multivitamin, you would have the basic effect of the PowerBar. This combination would cost much less than purchasing a PowerBar. The "science" of PowerBar is based on how human's consume energy. The Masai tribe of Africa doesn't eat PowerBars and they cover miles in a day. Humans evolved with whole food so there is no reason why you can't just eat a whole food snack and have it fulfill your energy needs.